COLUMBUS, Ohio — Reindeer have feet like snowshoes, antlers like a rocking chair, and connections in story and song to Santa Claus. But they don’t live wild in Ohio. Neither do caribou, which belong to the same species (see No. 2 below). And Marne Titchenell — who’s a wildlife program specialist with the College of Food, Agricultural, and Environmental Sciences at The Ohio State University — hasn’t even seen them in Alaska. “I went there a couple of years ago,” she said. “I thought I had a good chance, considering there are more caribou there than people. But no dice. Titchenell has a sleighful of experience, however, with a reindeer and caribou relative. White-tailed deer live in all 88 of Ohio’s counties, have reached nuisance levels in some cities, and part of her job is teaching workshops that show people ways to deal with them. 1. Reindeer used to be Buckeyes. Once upon a time, about, hmmm, at least 10,000 years ago — until the end of the Pleistocene Ice Age — reindeer lived in the area that became Ohio. Paleontologists have found reindeer fossils in the Buckeye State and Georgia, Kentucky, Tennessee, North Carolina and West Virginia, among others. 2. Reindeer are the same things as caribou. In general. But maybe, somewhat, not. Reindeer and caribou belong to the same species, which is Rangifer tarandus. In general, people use “caribou” in North America, “reindeer” in Europe and Asia. “Caribou” also tends to refer to the larger, wild R. tarandus types, like the ones in Canada and Alaska, while “reindeer” often, but not always, means the slightly smaller, domesticated kinds, like many of the ones in Scandinavia. Scientists say in all, there are 14 R. tarandus subspecies and at least four domesticated breeds. A 2013 study complicates matters. Based on DNA analysis, the study suggested that reindeer/caribou should be in two groups. One group is the caribou in southern Canada. The other group is the caribou in Alaska and northern Canada plus the reindeer in Europe and Asia. The scientists who did the study said the Ice Age split the two groups apart about 200,000 years ago, and their genes and adaptations to their environment, including to changing climates, are somewhat different because of it. Reindeer are members of the Cervidae, or deer, family. The Cervidae family, to name a few, includes elk, moose and Ohio’s white-tailed deer. 4. Reindeer DO go click, click, click. 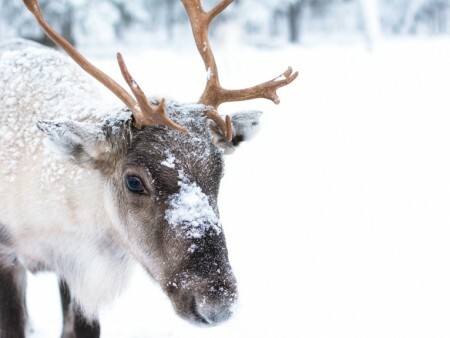 Reindeer make a clicking sound when they walk, and not just when up on a housetop. Tendons snap over sesamoid bones in their feet, and that’s what makes the click. Experts think the clicking helps the members of a herd stay in contact, especially in snowstorms or, say, when it’s foggy. 5. Reindeer also vocalize. Which doesn’t count shouting with glee. Reindeer cows grunt to their calves. Calves bleat and bawl to their mothers. Males snort, hoot, bellow and rattle hoarsely when trying to attract a mate. A special inflatable air sac in the neck gives the calls of the males extra oomph. 6. When a reindeer senses danger, it may sniff, listen, stare, urinate, ‘wheeze-snort,’ rear up and jump in the air like a stallion, then run away. Often in that order. Scientists call the rearing up and jumping an “excitation leap.” It’s a visual warning to other reindeer. It could mean there’s a predator coming, like a wolf, a bear or a fearsome, toothy, bounceable biped you could even describe as abominable. 7. There’s a reason a reindeer can have a red nose. At least on the inside. And it’s gross. Flies called reindeer nose bot flies may deposit their larvae in a reindeer’s nostrils. The larvae then grow in the throat or sinuses. One of the results can be inflammation. But you couldn’t really say the nose glows. The reindeer sneezes them out in spring. 8. A reindeer runs faster than a grandma. A reindeer can run at speeds of up to 48 mph. A grandma walking home from someone’s house Christmas Eve, or any other day, averages about 3 mph. If both the reindeer and grandma were traveling in the same direction and following the same path, the grandma indeed and unfortunately would get run over by the reindeer. Even Olympic gold-medal-winning sprinter Elaine Thompson, who’s capable of about 21 mph over 100 meters, would have hoof prints. 9. ‘Up on the House Top’ — and its composer’s house — have histories in Ohio. Finally, there’s a reindeer tie to Ohio in music. Benjamin Hanby — who was born in Rushville, lived in Westerville and went to Otterbein University — composed “Up on the House Top” in 1864. According to its Wikipedia entry, the song is “considered the first Yuletide song focused primarily on Santa Claus” — and his four-footed, foot-clicking helpers. Hanby was a minister, abolitionist and helped with the Underground Railroad. Today, his Westerville home is preserved as the Hanby House State Memorial, is listed on the National Register of Historic Places, and is included in the National Park Service’s Network to Freedom of significant Underground Railroad sites.